While rewriting the Oakley draft on Aldred’s adventures with Bishop AElfsige in Wessex, I have been reconstructing the Dorset landscape as it might have been in the late tenth century, using Domesday Book and charter data (Electronic Sawyer, but PASE provides an excellent search gateway as well). The Ordnance survey map is fine for showing the present day locations of ancient and medieval evidence around Oakley (barrows, dykes, Roman roads, etc), but it does not indicate the older woodland and pasture areas in relation to tilled fields. GoogleEarth gives a satellite view that is dominated by tilled fields with recently planted woodland “plantations” and not much in the way of pasture and meadow. However, the Domesday Book evidence suggests that Woodyates and Pentridge were dominated by woodland and pasturage more than ploughland, unsurprising in the chalk downs without the kind of major rivers and streams found northward around Old Sarum. Both Woodyates (Odiete) and Pentridge (Pentric) in Domesday Book were held in the reign of Edward (TRE, pre-1066) by the Abbey of St. Mary’s Glastonbury, although charter evidence also shows a Beorhthere receiving land at Woodyates under Eadwig (955×959) [PASE Beorhtere 5; Sawyer 1753 but no text available online]. Glastonbury’s claims are hard to date from the charter evidence, but more than likely in 970 they already held the land at Woodyates and Pentridge Domesday Book records. To the southwest, Sixpenny Handley (Hanlege; the Sixpenny part is after the merger in the 14th century with Sexpenna) was much larger than Woodyates and Pentridge; it was held by St. Mary’s Shaftesbury, a women’s house. I can have Aldred walk from the Glastonbury lands through Beorhthere’s and then down until he impinges on Shaftesbury’s lands, but I am not sure yet who held the lands around Oakley Down–a lot depends on configuring the sizes given in Domesday with the existing landscape. Woodyates in Domesday Book paid geld for 4 hides and had land for 4 ploughs; and overall was worth £4. The demesne is listed as having 3 hides 1 virgate; 1 plough; 3 slaves, 2 villans, 5 bordars, and [gap]. But interestingly, its pasture was 16.5 furlongs length and width and its woodland 7 furlongs long by 5.5 wide. A hide= 120 acres (0.1835 mi2 and a league= 1.5 miles, or 12 furlongs, so 1 furlong= .125 mile. I used decimals in miles in order to draw ruler lines in GoogleEarth. By these calculations, Woodyates was somewhat under 4 miles square, although of course its land wasn’t actually a neat square. 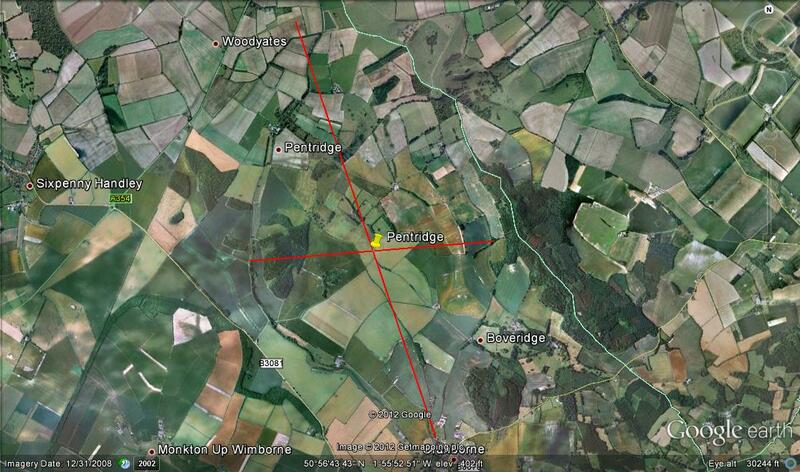 Pentridge in Domesday Book paid geld for 6 hides and had land for 6 ploughs; it was worth £6. Charter data (Sawyer 513, 944×949) shows King Edmund giving it as part of a larger grant to his queen Æthelflæd for life, with reversion to Glastonbury. After the Conquest Domesday Book says it was held by the king in demesne with 1 plough, 4 slaves, 6 villans, and 6 bordars with 3 ploughs; curiously, Wulfweard, who held it before the Conquest, “could not be separated from the church.” I don’t know if this means he was the priest of its church, presumably appointed by Glastonbury, or some other kind of dependent who, for whatever reason, could not be dislodged. Pentridge has more tilled acreage than Woodyates, but it is long and narrow in its pasturage and woodland: pasture was 8 furlongs x 4 furlongs and woodland 1 league long by 3 furlongs wide. 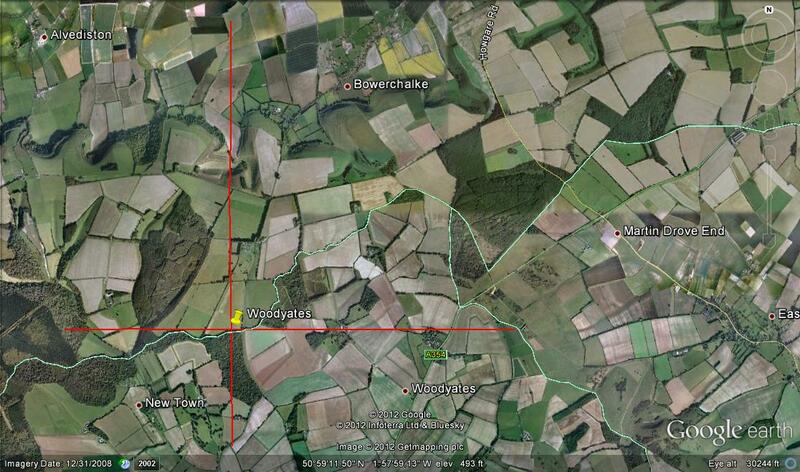 This fits with the terrain situated between the Roman road (Ackling Dyke) on the west and the hilly area to the east. Handley in Domesday Book before the Conquest paid geld for 20 hides and land for 9 ploughs, worth total £8. In demesne it had 3 hides, 3 ploughs, 3 slaves, 16 villans, and 9 bordars with 6 ploughs. It also had a mill rendering 10 shilling and 30 acres of meadow, in addition to small woodland and pasture (each 1 furlong square). That 20 hides translates to 3.67 square miles, a huge amount of tilled land compared to Woodyates and Pentridge, where animal pasturage must have been the dominant mode (probably sheep). St. Mary’s Shaftesbury therefore owned a productive estate, granted to them with some other estates by King Alfred for some curious reasons having to do with his daughter Æthelgifu placed there, and some obstruction of justice sins (Sawyer 357, in Old English and Latin). The charter includes Gussage with Handley in the 20 hides, so that makes it a bit easier to map it out southward. 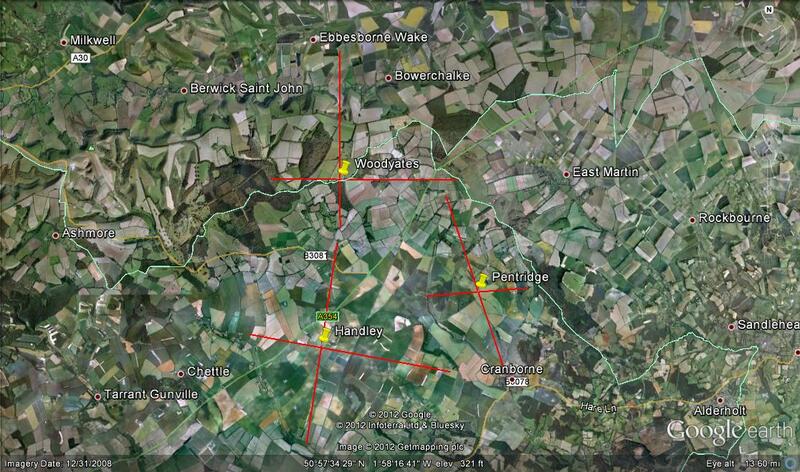 This leaves Oakley Down barrows at the intersection of these three estates, which may provide a basis for the “tent meeting” Aldred and AElfsige have there, perhaps involving Glastonbury and Shaftesbury personnel in a discussion of boundaries–or monastic reform–with Cuthbert mediating. As for flora and fauna, I have lingering questions. My favorite old fashioned resource is the Victoria County History (VCH), but annoyingly for Dorset vol. 1 with the basic landscape info is not published (volumes 2 and 3 are); so I may dig through Wiltshire and Hampshire for info. Trees: I expected oaks, given the place name, but what I saw and took pictures of are not oaks, although between human-created plantations and oak diseases this is not surprising. Animals: I am thinking sheep in the pasturage–handy for wool, meat, and parchment, with some cattle and goats for milk and cheese. Woodlands have many resources–wood, birds (I saw pheasants), nuts, pig forage, perhaps red deer? I may have also seen a hare. Crops: what grows well on chalk downlands? I need to check my early medieval and Anglo-Saxon farming books and articles in my office, but suggestions are welcome. I know the Chilterns area quite well, also chalk, and a wide variety of crops seem to be grown at the moment, including beans (relevant to the 10th C), grain (ditto) and variously named yellow-flowering crops, all of which produce oil for margarine and cooking (not relevant to your period! ), but the signature crop is pasture and I would imagine that was the case in the early medieval period too. Apropos of woodland and meadowland measures in Domesday, they have always seemed to me to be very odd and I cannot possibly imagine that the areas concerned were laid out in neat rectangles, so many furlongs long and so many wide. 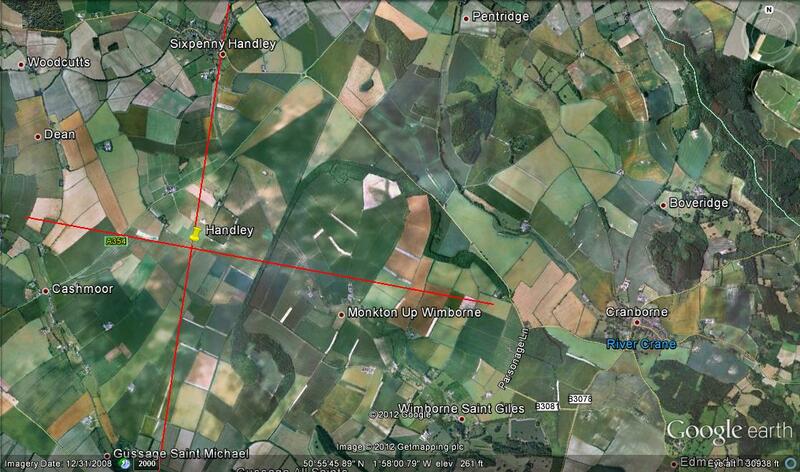 When trying to reconstruct land use for Nottinghamshire, I have always found the parish boundaries useful. I know that many doubts have been raised about speculating with them so far back, but all the same, they often help to make sense of the size and configuration of Domesday manorial holdings. Your source of information for charters sounds fabulous and I will check it out for my area. Meanwhile, I’m sure you know Della Hooke on Trees in A-S England (Boydell Press 2010)? As always with her stuff, it is very helpful about the landscape as a whole, not just trees. Thanks, Sally. I did see all of the yellow flowering plants and thought initially they were mustard (seemed excessive), but then I saw the same in Ohio and discovered from my relatives there that it was safflower. As for grain: which ones I am still checking the VCH info (also, Peter Fowler, Farming in the First Millennium AD, is a useful guide). As for trees: although I do have Della Hooke’s Landscape of Anglo-Saxon England, I have only seen her Trees book via InterLibrary Loan and will need to get it again. However, in the Landscape book (p. 162), she notes that Domesday Book uses silva pastilis for wood pasture. The woodland in the Woodyates, Pentridge, and Handley entries are not listed as pastilis, which means they were perhaps more dense and used for other purposes (BTW: if you know exactly what entry you are looking for, you can get a snippet view in GoogleBooks of the Latin in Morris’ edition of Domesday Book, saving a trip to the library). As for the shape of things: I agree, Domesday Book dimensions are not meant to indicate square lots. Hides of ploughed land would be in long strips and therefore rectilinear. 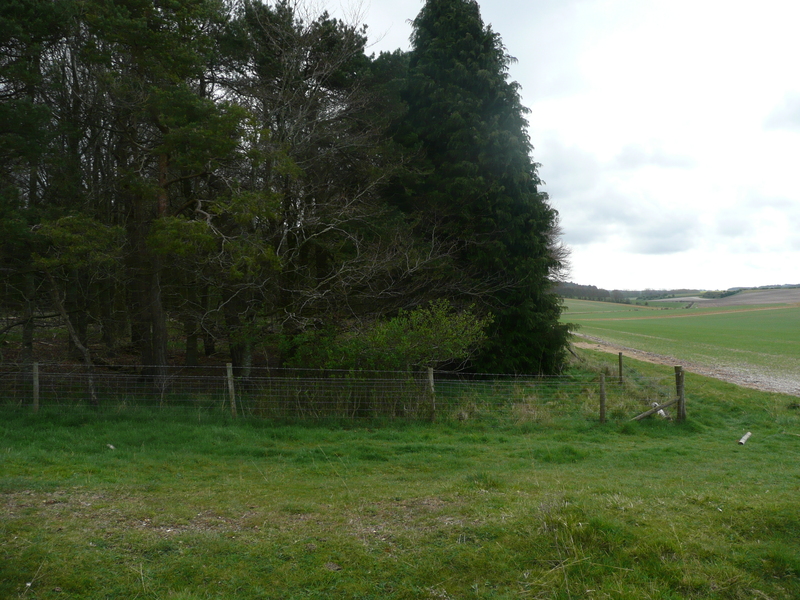 Pasture bordering ploughed fields might be rectilinear, but woodlands would be irregularly shaped and, more important, the portion listed might be only one part of a larger woodland of which other estates have a share. In this case, woodland to the west of Woodyates includes the larger zone of Cranborne Chase (not to mention the Selwood, an ancient boundary). By the way Karen, do you know Higham and Ryan, eds, The Landscape Archaeology of A-S England? (2010)? Its all a bit late for my period, but there are some very good chapters on the shift from barley/scattered settlement/ard ploughs and individual fields to wheat/nucleated settlement/wheeled ploughs and open fields. I would have thought that shift was well underway by your period. I probably need to buy it rather than get it from ILL. However, my sense from other literature is that the Dorset area was already nucleated settlement, fairly early and certainly by the tenth century. But whether wheat was a big crop is still unclear to me, versus pasture animals and woodland. I don’t want to mess up your mapping–I have a post about this sort of thing brewing myself, indeed–but that equivalence may not be very solid. There’s two issues: firstly what a hide actually is and then secondly whether Domesday was counting straight. The geld ratings in Domesday Book had sometimes been tweaked up or down, so the number of hides a place paid for might not be what it actually had. But more important is the first worry. In the earliest usages we have for it a hide is the amount of land that will feed a household for a year. That can be a lot less than 120 acres on good land, and I’d have thought 120 acres was the absolute upper end of any normal range. These things became fixed later, of course, as the Old English terminology became less intelligible, but Domesday’s figures may well not give you the kind of confidence you can map, alas. Thanks, Jonathan, for the reminder. In fact, I am finding the charter boundaries (where we have them) much more useful for mapping, along with a whole series of articles by Grundy. Even later parish boundaries seem to provide better indicators.